This image was resized. A dark image, the contrast and brightness was increased. Otherwise it was cropped directly from the image provided by Malin Space Science Systems. 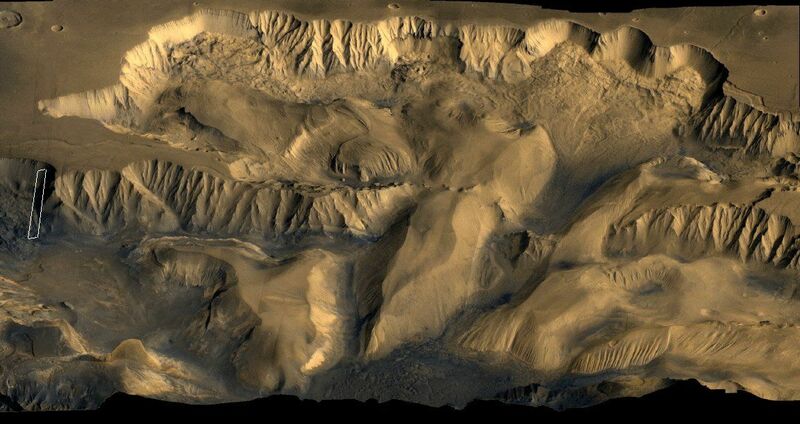 Paul McLeod was the first to spot this feature on the north wall of West Candor Chasma. 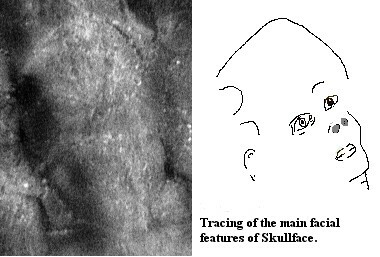 The outline of the Skullface head was brought to the attention of SPSR president Dr. Horace Crater by G. Orme. The extended analysis of the entire image presented here is by Crater, Levasseur, and other SPSR members and associates. 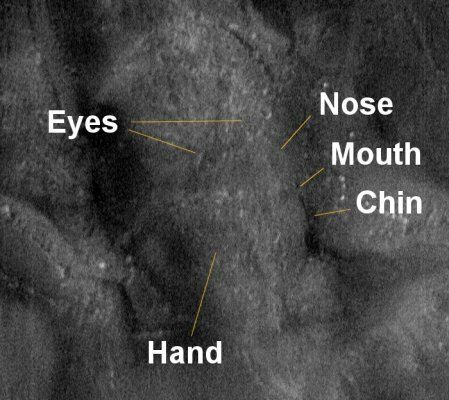 Read "Face-like Feature at West Candor Chasma, Mars MGS Image AB108403", published in the Journal of Scientific Exploration, by Dr. Horace Crater and J.P. Levasseur. Click North Wall of West Candor Chasma for a look at a magnificent Viking mosaic in which the location of the 8403 Skullface image is depicted. Eyes: The two eyes are especially compelling because they contain all the parts of a human eye in correct position and proportion. The right eye (your left) has a pointed oval lid aperture, an upper and lower lid, an iris, and pupil. There even appears to be tears flowing from the eye. There is also an upper tarsal section, the crease in the upper lid where the skin folds as the lid elevates. The left eye has nearly the same features and appears to work in tandem with the right, a matched pair of eyes fixed on a point in the distance or maybe staring off. Nose: Just below and between the eyes, two large nostrils are visible in an upturned nose. Mouth: Below the nose there is a mouth with two closed lips. Cheekbone, Chin, & Neck: Turned about thirty degrees from full front, features such as the cheekbone provide the appropriate outline for a face. Medallion Hand: There appears to be the back of a right hand in front of the face near the mouth. Apparently belonging to another figure left of picture, this hand has thumb and forefinger extended, the remaining fingers curled in. It appears this hand is in the process of putting a medal around the neck of the central Skullface figure. Can you see the medal? Click on the tracings and animations above for more clues. Hand Atop Head: Dan Levasseur was the first to note what apparently is a right hand atop the head, the thumb resting between the eyes and casting a shadow across the right eye. This hand belongs to yet another figure to right of picture. A disc and other objects appear strapped to the back of this hand. The Skullface figure appears to be one of three human figures depicting a scene or freeze-frame. The "Official" is at left of picture and appears to be in the act of reaching around to clasp the chain and medallion around Skullface's neck. His right hand, in front of the Skullface right cheek, appears large in comparison to the Skullface. Tall, he seems to be wearing a mask. 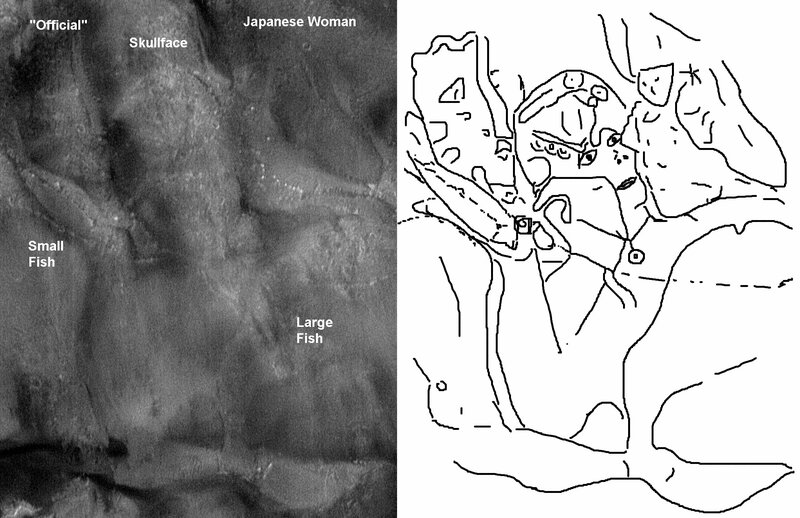 Apparently a female figure with a Japanese-like hairstyle is leaning in close to Skullface from right of picture. The "Japanese Woman's" right hand rests atop Skullface's head. This hand appears to have a watch-like apparatus and other interesting features. She also appears to have several ornaments in her hair. The end of her sleeve can be seen near Skullface's left eye. Skullface appears to be holding a fish in her right hand. The fish is on a hook/lure, the fish line extending to right of picture. Apparently Skullface is holding a large fish in her left arm, its tail extending to bottom of picture. There are numerous other interesting features in the 8403 image that are not depicted here. 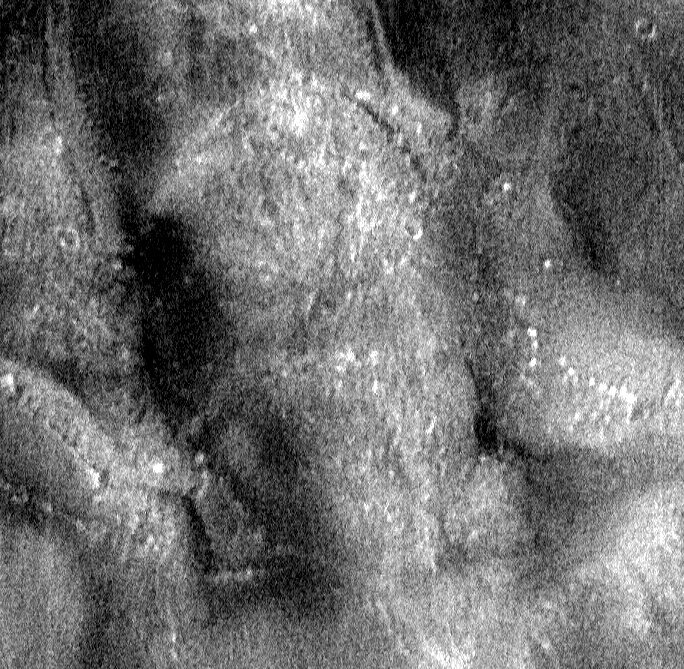 These include what appear to be some elephants (other than the ones in the Torun Viking image). The trunk of one of them appears to superimpose over the Skullface head, curling up from under the large fish such that the nostrils are visible.